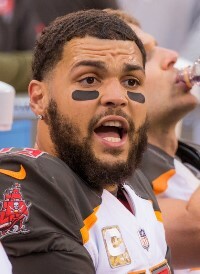 Julio Jones won’t play, so first alternate Mike Evans will make his second trip to the Pro Bowl. See you in Orlando, Mike! Very happy for ya, Mike, and well deserved. Well deserved! RIP’EM up #13!!! Way to go Mike-E. Well deserved and BS you weren’t starting anyway. They need to bring this game back to Hawaiii, there at the very least we get some nice scenery to look at. Pro bowls are meaningless…. by time everyone backs out or claims injury half the freaking league makes the laughingstock pro bowl. Wish bucfan cared as much about wins as they do meaningless pro bowls… how many play off wins did cancer93 pro bowls translate to????? Win —- nothing else matters…. Congrats Mike! You da man! Joe- please ask Evans how hard he LOLed at Peter King’s Antonio Brown comment. TY! It was BS you were an alternate as it is. Congrats Mike! I guess I am buying another ticket to the Pro Bowl! I had fun last year and it was simple to walk to the lower bowl to give some positive vibes to GMC. I will say that the venue ran out of custom jerseys though. This year I’ll just have to make sure to get my ME13 pro bowl jersey early! Congrats to Evans on another great year! Watch what he can do with a QB that can hit him in stride…. GOAT WR in Bucs history, and now the first and only Bucs WR to have multiple Pro Bowl nods. Young man is well on his way to Canton. Mike, you are the best all around player on this football team and it has been a pleasure watching you develop into a top flight WR. The sky’s the limit for you- this is just the start of what will undoubtedly be a storied career. Congrats on this much deserved recognition. Keep making us all proud! Congrats Mike, now tell them no. Don’t waste your time with those idiots after they dissed you and don’t risk injury. Mike Evans is better than Julio Jones anyway. Bucs fans were so aggravated they(including me) did not vote for anybody. Big Mike was definitely slighted this year being a 1st alternate – so I’m glad he is going. Totally deserved. Congrats! America’s Receiver Pro Bowler Mike Evans… a title that he can actually live up to. Groping glove not needed to cover finger prints. Tmaxcon and Reality is a Beotch are the only celebrity poster who I enjoy listening to. The rest of you are sad and pathetic, because it’s a gimmick. Big Mike!!!!! Or should I say BEAST MIKE!!!! Congrats Mike!!!! You more than deserved to get in there! I have to admit that I have grown to love tmaxcon’s fire, too, even though I have caught his ire on a few occasions! Jameis Bashers love to talk about stride. Stride off of your Jameis hate and life will be easier. Ditto. I appreciate the road you’ve traveled, and how you have come out on top. Thanks, also, for showing understanding on the whole kneeling thing. Cheers to better days and more wins for the Bucs!